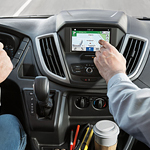 The Transit comes with a six-month trial to SiriusXM Satellite Radio. With SiriusXM Satellite Radio, you can enjoy more than 150 channels of music, entertainment, sports, comedy, and news. To listen to SiriusXM Satellite Radio on your smartphone or computer, all you have to do is download the SiriusXM app. The Lane-Keeping Alert with Driver Alert System is another technology feature of the Transit. This system uses a camera to scan lane markings. When it detects lane drift, it will send the driver an alert through a series of vibrations on the steering wheel. When the Driver Alert System detects that lane drift is because the driver is tired, it will issue visual and audible alerts.